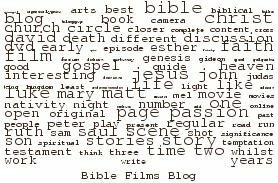 In order for visitors to the site to find info on specific film straight away, I've added 3 film indexes, one for Hebrew Bible / Old Testament films, one for Jesus films and one for films based on the rest of the New Testament. Each one has links to blog posts, my reviews, scene guides and significant articles by other writers. I'll be updating that regularly, so that hopefully nearly every film will have links. 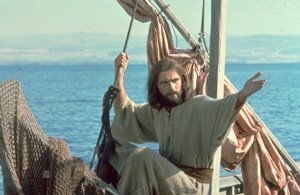 This is a collection of some of the best articles on the web about Jesus films. The authors of these have covered a number of Jesus films in each article, rather than just one, and I'll expand it as I go on. Recommendations would be much appreciated, os if you have one (or you yourself have written one I've not included), please let me know. A Coptic / Arabic Jesus Film? Jeffrey Overstreet has discovered news about plans to make a Jesus film in Arabic. It's a plan between Coptic Christian Fayez Ghali, and a Muslim producer Mohammed Uchub/Ashub/Ashoub, and has already caused quite a stir, even though it would appear that the film is a long way from being made. In particular, when they requested authorisation from Al-Azhar, an ancient mosque that has extended to become an academic institution, and the "highest authority in Sunni Islam",1 they were told that "the image of the prophet [Jesus should] not appear". Peter T Chattaway has rounded up a number of different news articles on the story, so I recommend you read his post and the various links he has assembled. One thing that does seem strange is that there are already two films that provide something of a precedent here. Firstly, the Jesus film (1979), has, of course, been translated into Arabic already. 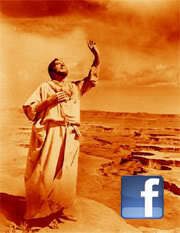 Secondly, as others have pointed out, The Passion of the Christ played in Egypt without problems. Indeed some cited its generally positive reception as evidence of its anti-Semitism. Part of the reason I was slow out of the blocks on this one is that I'm not overly optimistic that it will ever get made. I hope it does. 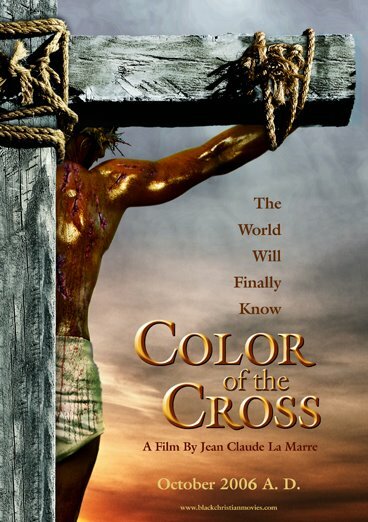 Whilst I eagerly anticipate seeing this years' films such as Son of Man and Color of the Cross, which have black actors playing Jesus, I long for the day that a Jewish / Middle Eastern actor plays him. I am amazed that no-one has done this yet. 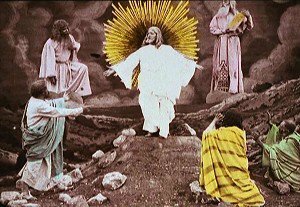 Of course Carl Dreyer spent 16 years trying to make a film about the Jewish Jesus. (There is an interesting Variety article on this). It seems strange that so long after that project failed we are still awaiting another one - despite the frequent aspirations to realism that Jesus film directors routinely trot out. Anyway, hopefully this will be the first film to use someone from Jesus' part of the world to take on the role. This Easter, I'm due to be appearing as one of the interviewees on Channel 4's Bible films programme The Passion: Films, Faith and Fury. It's hosted by Dr. Robert Beckford (pictured right), who I met at this summer's Greenbelt Festival. The programme is showing on Easter Eve (15th April 2006) between 7pm and 9pm. The Passion will document how Hollywood and the television industry have dealt with the thorniest of subject matter: the Bible. Taking each decade in turn, the film explores the changing dynamic between the church, and the film and television industries. From the passion plays of the silent era to the blood and suffering of Mel Gibson's The Passion of the Christ and onto the supernatural world of Revelations. With interviews from the producers, directors and stars of the films as well as leading religious figures the film investigates how the political climate has often changed the portrayal of the Bible in films. The presenter lead programme (Christopher Eccleston TBC) asks what do these films and programmes tell us about our evolving views of Christianity? I note that this says Christopher Ecclestone is involved as well / instead. I got an email from Dr. Beckford in January saying he was about to do the voiceover, so I assume he's still involved. I won't get to see it until it airs so I guess I'll have to wait until then to find out. I'm also not entirely sure how much I'll be involved. They have interviewed Martin Scorsese, Willem Dafoe, Terry Gilliam, Robert Powell, Brian Blessed, W. Barnes Tatum and Peter Malone, so I don't imagine I'll get much of a look in, but they have told me that I am in it, so who knows. I also don't know what I'll be saying. They interviewed me for about an hour, but I imagine they'll only use 10 seconds worth, so goodness knows what it will be. Regardless of my personal involvement, it looks like being an interesting programme. The team that put it together were well researched, and its probably the longest broadcasted programme on this subject. I do remember catching the end of one about 10-15 years ago with Barry Norman (which was the first time I heard of Jesus of Montreal), but I believe that was only an hour. There is also a documentary called The Bible According to Hollywood available at Amazon, with very mixed reviews. I'm hoping The Passion: Films, Faith and Fury will be the pick of the bunch. The Passion: Films, Faith and Fury, will be airing at 7pm on 15th April on Channel 4. On paper King of Kings (1961) should have been one of the most successful Jesus films ever made. 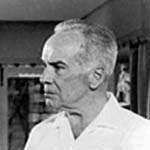 Producer Samuel Bronston and writer Philip Yordan were just months away from making the smash epic El Cid, Nicholas Ray was one of Hollywood's hottest new directors, Mikos Rozsa wrote arguably his best ever score, and Jeffrey Hunter, possibly the most aesthetic Jesus ever, lead an impressive cast. Somehow, even despite the face of Jesus finally returning to cinemas after a long exile, it all went wrong. Whilst this film still ranks amongst my favourite Jesus films, it's certainly the least defendable selection. Ironically, it is perhaps precisely because of the many big names amongst the film-makers that things went so awry with the final product. Whilst Bronston, Yordan and Ray all had good reputations, they had been earned in different fields. Bronston's ability to produce opulent epics a million miles away from Ray's more personal films such as Rebel Without a Cause (1955), and the masterful In a Lonely Place (1950). Furthermore, a clash between these personalities seems to have left the film in a mess. According to Nicholas Ray biographer Bernard Eisenschitz1, at the last minute Ray was told to include the Jewish rebellion action scene three-quarters of the way through the film, and an extra character called David (played by Richard Johnston), was brought in to play a similar role to the finished film's Judas. By then the film was 3½ hours long, and although Ray thought that was necessary, Margaret Booth (head of the editing department) decided to cut out "David" altogether. This resulted in one scene between Barabbas and "David" having to be re-filmed with Judas instead. As a result of these major, last minute changes, any sense of continuity was destroyed, as was the long standing friendship between Ray and Yordan. To make things worse, once Ray had left the project, his final scene of Jesus leaving the disciples on a mountain was replaced by the now infamous "giant-Jesus making a cross on the beach" shot. Worse still, Jeffrey Hunter's dialogue was re-dubbed in its entirety so that he would have a lower, more serious, voice. Given all this internal wrangling, it is hardly surprising that the film falls short of it's potential. It never really seems to know what kind of film it is. Is it a Roman action epic, or an introspective look at a rebel with a cause?2 Thankfully it is possible to peer through the rubble of the finished film to glimpse what it might have been. In fact, in places the film really soars. Perhaps the best scene in the film is the lengthy Sermon on the Mount scene, "Ray saw it as the linchpin of his film", and thankfully the final version of it remains strong 3. The sermon is built up from a number of different angles as Jesus' friends, his foes, and those who are simply curious to hear him gather to hear him lay out his views. After opening with the beatitudes, he moves amongst the audience to take questions, plying them with various sections from the gospels as he goes. Whilst many scholars today would questions whether such a "sermon" actually existed, Ray's attempt at demythologising it by interspersing it with the audience's questions does provide a more realistic scenario. Another real high point of this film is the use of colour. The action constantly takes place under an intense blue sky. There is a real vibrancy of colour in the costumes from the luxurious colours of the Romans and Herodians, to the everyday colours of the normal people that gather around Jesus. 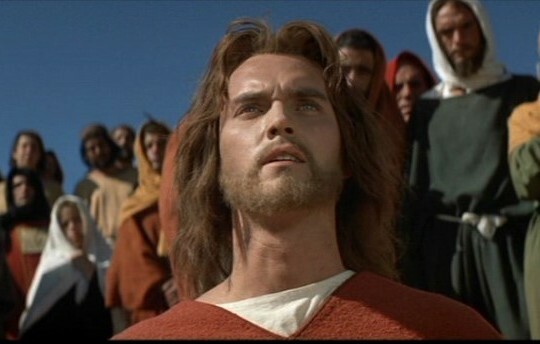 Whilst many Jesus films are concerned with Jesus's eyes, none give so many intense close shots of them as this film. I've never seen it on the big screen, but the effect of such arresting shots of his azure blue eyes shown on such a scale must have been overwhelming. 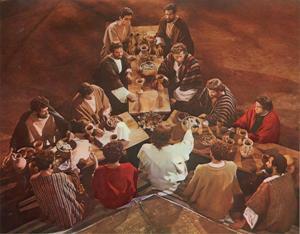 Perhaps the most interesting use of colour in the film is Jesus's robes. 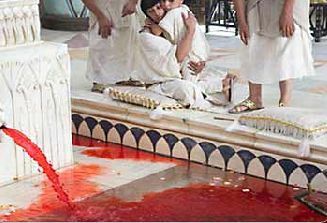 The opening scenes before his baptism show Jesus wearing dull browns, but once his ministry begins he switches to an intense red robe - rich in connotations of authority, danger, leadership, passion, and of course of his blood that will soon be spilt. However, once he enters Jerusalem for the final phase of his ministry he switches to a white garment, emphasising his purity and presumably his innocence in all that he is about to undergo. The other key device that the film uses is that of a fictional Roman character, Lucius, played by Ron Randall. Lucius is first introduced as a loyal soldier who's conscience is stung when he is instructed to carry out Herod's orders to massacre Bethlehem's infants. He again happens to meet the boy Jesus in Nazareth, and finds himself encountering the adult Jesus as his popularity swells. Sent by Pilate to spy on the Sermon on the Mount he is deeply challenged and ultimately becomes the centurion exclaiming those immortal lines as Jesus dies. Lucius provides a way into the film for the viewer. Whereas the other characters have already been influenced by various connotations, Lucius is neutral, and as he, like the viewer, sees more of Jesus, he is changed by what he sees. Perhaps one of the strangest things about this film is how little time Jesus actually spends on screen. Excluding credit sequences etc. 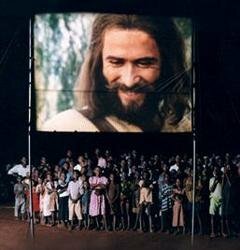 Jesus is onscreen for less than half of the film's remaining run time. The rest of the film is taken up with Barabbas and the zealots' fight against Rome. This was the first major Jesus film after the discovery of the Dead Sea Scrolls, and the greater awareness they brought about the zealots and their fight. Whilst this subplot sprawls seemingly out of control, King of Kings is one of the few films to place Jesus in this kind of revolutionary saturated context. At one point Barabbas contrasts himself with Jesus, declaring, "I am fire he is water", unaware that as does so, water is shown literally overcoming the red hot swords smelted in the zealots' fire. These scenes do seem to gain a little too much screen time, but they are undoubtedly well executed. Whilst this detracts somewhat from the more thoughtful film about Jesus that I suspect Ray intended, it does at least make entertaining watching. And from time to time there are some memorable moments. Perhaps most significant about this film is the way it embodies its subject. Just as in the film the political machinations seem to overwhelm Jesus and lead to his downfall, so the film falls down by swamping Jesus with a depiction of that same politics and violence. Ultimately though, it is the Sermon on the Mount that has the most lasting impact. 2 - It is obligatory to use this line in every discussion of this movie. Mark Goodacre's New Testament Gateway Blog drew my attention to this - FInd your blog cloud. Here's mine. On Tuesday I looked at the meagre selection of films about Ruth. There is one extra "film" that I didn't cover then since it is only 15 minutes long, but given the poor selection I thought it would be worth covering. 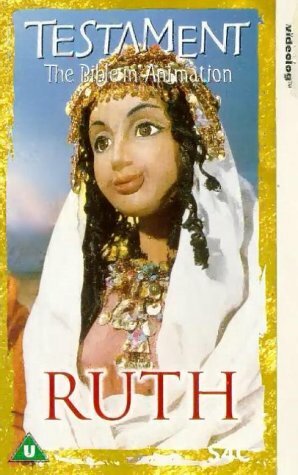 The film is called Ruth, a Faithful Woman, and it is part of the Living Bible series of films. (I reviewed Gideon, the Liberator last month. It was created by the same team that made Gideon and the rest of this Hebrew Bible series - written by Betty Luerssen and directed by Edward Dew. The film like most in the series doesn't really attempt to offer much interpretation to the events that it depicts. There is the odd explanatory note by the narrator, such as when Boaz and his close relative sit down to discuss their field, but these films otherwise play the stories with a fairly straight bat. Obviously every film version of a written text offers some interpretation, nevertheless some do this more than others. (For what it's worth the most unusual aspect of this scene where the closer kinsman gives Boaz his sandal is pictured below). The intended audience of these films was probably Sunday School children who had little or no knowledge of these stories, and by that standard they are fairly effective. That would also explain the only glaring omission from the story - the episode where Ruth "sleeps at the feet" of Boaz. Many scholars consider this to be a euphemism, and I suppose that even taken literally it is hardly the kind of thing a Sunday School teacher wants to encourage her class to do. It's a shame though that of only four films about Ruth, half of them are for children, and one is so old that the emotional/relational/sexual implications of this scene are unexplored. Underneath the thick layers of cultural practice there is an interesting story, but few biblical stories are so encased in their times that they remain so impenetrable to all but the most scholarly. A few years ago, I did a lot of research on Cecil B. DeMille's Moses films The Ten Commandments (1923 and 1956. 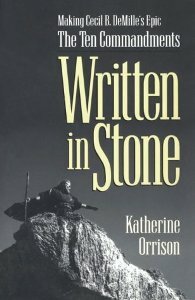 Somewhat annoyingly, shortly after I had written everything up, I discovered that Katherine Orrison had written a book solely devoted to the later Charlton Heston film. Fast forward a few years to 2004 and we find that Orrison is now doing a commentary on the special edition DVD of The Ten Commandments (1956). 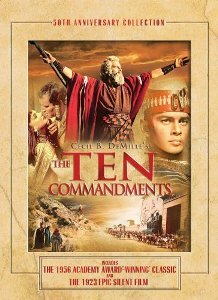 As I mentioned a week or two ago, a new The Ten Commandments boxed set has just been released with both versions of the film included. Orrison has also done a commentary for the silent (1923) version of the film as well for this set and accordingly Peter T Chattaway has interviewed her for Christianity Today. From the interview it's nice to see that Orrison has such a deep love for the film. I hope that comes across in her writing as well as in this interview. One of the things that interested me was that it seems that there was some doubt whether to include on the DVD the opening scene where DeMille comes out from behind the curtain to address the audience. This scene is certainly remarkable for it's uniqueness, and it seems strange that the DVD producers could even have considered removing it. It's such an integral part of the film. I wonder if it was Orrison's reaction that persuaded them to change their minds. Peter says at his FilmChat Blog that he's going to post the full interview there shortly. 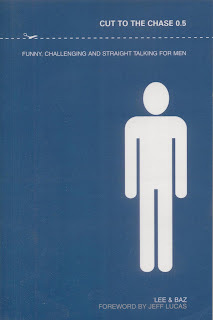 I'm looking forward to it, perhaps it will finally convince me to get around to buying the book. I mentioned a couple of weeks ago how several Hebrew Bible films have been released on DVD in the run up to Easter. In particular, the boxed set of both Ten Commandments films marking the latter film's 50th Anniversary, and David and Bathsheba (1951). (I should really get one of those Amazon commission deals set up!). There are details about the DVD at DVDBeaver including some nice screen shots of the film. There are, however, few online reviews of the film, other than "customer reviews" the only review of any depth that seems to be around is the original New York Times review from 1960. 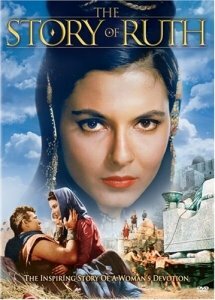 The Story of Ruth is another Old Testament Film that I have never seen. It is also quite surprising that although there have been numerous films about Esther this is the only feature length film that I am aware of that is directly about Ruth. There is half hour claymation film Ruth (right) from the 1994 "Testament" series. This series covered nine biblical stories in a range of different animation styles from plasticine / claymation through to more traditional hand drawn animation. It was a collaboration between Russian and Welsh animators. The other entries in the series were: Creation/The Flood, Abraham, Joseph, Moses, David and Saul, Elijah, Daniel, and Jonah. All 9 were fairly standard re-tellings of the story, which never captured much excitement. That said the animation was superb and in many cases, particularly Ruth the result was quite moving. The only other film I know of which has examined this material is Amos Gitai's 1992 film Golem, l'esprit de l'exil (Golem, Spirit of the Exile) which makes the story into a modern day allegory about the Jewish mythical creature who personifies exile, with Ruth, Orpah and Naomi living in 1990s Paris. 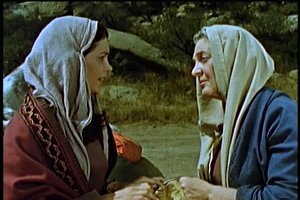 I'm only familiar with Gitai's Esther, but I've found a brief review of the film, and a pre-beard Peter Chattaway briefly mentions both Ruth films at the end of this page at Canadian Christianity and discusses it a bit more here. My review of The Exorcism of Emily Rose is finally up at Open Heaven. I actually wrote almost all of this upon leaving the theatre about 4 months ago, but I've been so busy since then I haven't had time to write it up and get it published. It got released on DVD yesterday so that gave me another deadline, which I finally met. If you've not seen it yet I'd recommend it. It's biggest strength is the way it subverts the genre to actually get the audience considering what they see rather than just being entertained by it. Christians often stay away from such films, but I hope more than average see this, even if it's not everyone's cup of tea. Tyler Williams has blogged the two films early (David and) Saul films I mentioned a couple of weeks ago. It's great to have some more in-depth comments on these two films, particularly as Tyler comes at it from a different angle than my original post. If you've not read it yet I suggest you do. There are however a couple of places where I wanted to comment on what he says, partly because he brings something new that I'm impressed with, and partly because in places he disagrees with my earlier comments and so I thought I would respond. Firstly, Tyler makes an excellent suggestion for how these two separate films are related. "From the discussion in Abel, however, it is clear that the Death of Saul on the DVD does not include its original beginning. Perhaps that is why excerpts from "Saul and David" were included at the beginning. That certainly seems like a good explanation to me. It would be surprising if either of these films were in their complete form, and the combined narrative does seem a little more rounded, if lacking the narrative arc that cinema quickly achieved shortly afterwards. Next comes the episode analysis, and there are a couple of places here where we disagree. Having read his counter-arguments I do partly agree. There are two places we disagree, both of which are from the first film David et Saul (1911). I'd like to start with the second scene first. Whilst the intertitles on these films aren't always that clear (they severely distort in places), they do identify the final scene we are shown in David et Saul as "Fatigued, Saul Seeks Repose in the Cave where David was Hidden". Somehow I missed that and from the following images considered instead the scene to be the more obscure episode from 1 Sam 23:24-28 where David and Saul are found on different sides of a mountain. 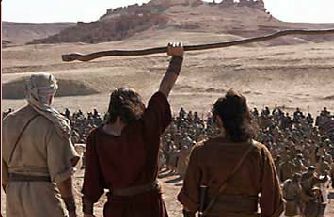 This is in part because the most famous part of this story (David cutting Saul's cloak from 1 Sam 24)is absent from the film. If we assume that the footage is incomplete then I have to concur with Tyler's assessment. This time around I also noticed that Saul does go into the cave where David and his men were previously, and that at the point where the footage ends, David does seem to be heading in Saul's direction. Of course it's possible that both Tyler and I got it wrong and the original scene was actually 1 Sam 26, which may or may not be the same story from a different tradition. This also challenges my identification of the earlier scene which originally I placed as David feigning madness whilst in hiding (1 Sam 21:10-15). 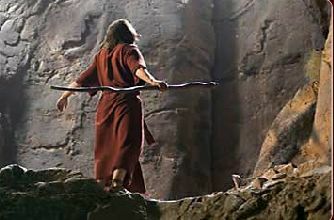 Tyler disagrees and considers it to be David hiding at the cave of Adullam (1 Sam 22:1-2). Having re-watched the scenes I have to disagree with both suggestions. As noted above the rocks and the caves shown are the same ones Saul relieves himself in later on. So it makes the most sense to see this scene as a pre-cursor to the later one (a sort of establishing shot), rather than a scene in itself. That said David does look a little mad in this scene (see the close up - right), and whilst this is probably just the vastly different acting style of that time, it may have been the director adding in David's madness as well. So I suspect the correct scripture passage for this scene is 1 Sam 23:29. According to Yahoo and the Hollywood Reporter Keisha Castle-Hughes (right) is going to play Mary in Catherine Hardwicke's up-and-coming Mary. I'm starting to get really excited about this film. My initial reaction was cautious, as I thought Mike Rich's script sounded like it could easily go awry in the wrong hands. But others were excited by the choice of Hardwicke, and although I'd not seen any of her films to get enthusiastic about in my own right, some of their excitement rubbed off on me at least a little bit. The news about Keisha Castle-Hughes however, has really got me interested. I'm a big fan of Whale Rider the film which made her the youngest ever Oscar nominee for best actress. Although she's now a little bit older (15), she is still young enough to challenge the traditional image of Mary as a woman in her mid 20s (it's a good deal more likely that she was in her teens, possibly as young as 12 according to some scholars). Furthermore, although she is no more Jewish or Palestinian than I am, she at least looks more Middle Eastern than the vast majority of actresses to take the role, in sculpture, painting, or in film. On top of this she has already produced one tremendous performance in a film that could easily have gone wrong with a different actress. And working with a director who has a reputation for gritty realism, but a writer who sounds like he is trying to work within the framework of the tradition story could produce explosive results. Filming is going to commence in Morocco and Italy during May. Apparently, the aim is to get this ready in time for this Christmas. 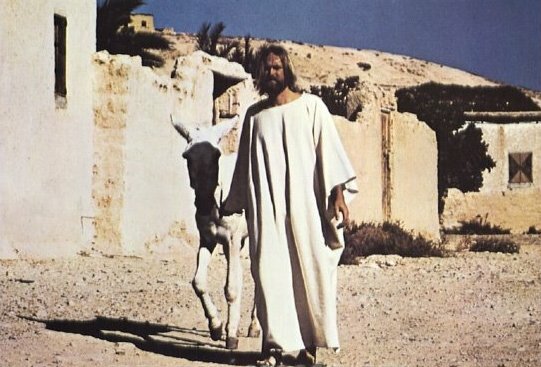 As I reviewed and discussed a few other articles about Jesus (1979) earlier this week, I thought I would finish off by posting the scene guide to the film. There are various different length versions of this film around, so this might not exactly correspond to the version you have. The list below refers to the 2 hour version, which I believe is the cut that aired in cinemas. 1 - For a relatively short run time, this film packs in a lot large number of incidents, often by cutting parts within each story as well as excluding certain episodes. However, there is also very little time spent on developing the character of anyone but Jesus, and even his character is barely explored in the way that most films tend to examine their protagonists. 2 - The political sections of Luke's gospel are largely expunged, in particular the more challenging verses to the rich and powerful such as the reverse beatitudes (Luke 6:23-26), sharing with those who are without (Luke 3:10-14), the six woes Luke 11:37-54). It also excludes the passage where a demonstration of Jesus's power yields only a meagre respose (The Ten Lepers of chapter 17), as well as awkward to explain passages such as the Shrewd manager of Luke 16), and the mini-apocalypse of chapter 21. 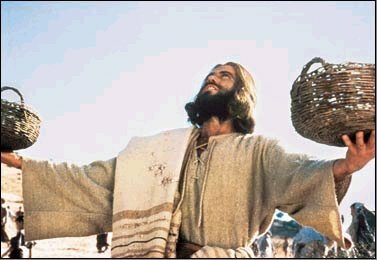 3 - On the other hand, it is also the only Jesus film to include certain incidents such as Zaccheus, The Widow's Mite, and the parable of the Pharisee and the Tax Collector, and the Parable of the Vineyard / Wicked Tenants. 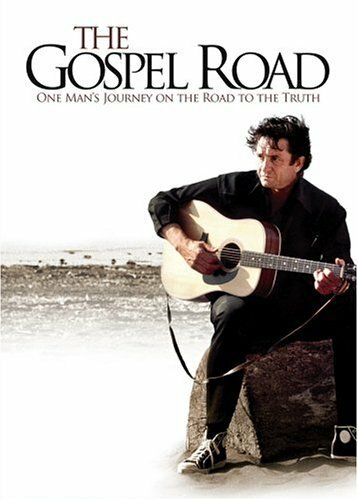 I can't believe I've only just noticed this, but Johnny Cash's 1973 film The Gospel Road was released on DVD two weeks ago. I've actually never seen it. The VHS version went out of circulation a long time ago, and as it's supposedly more of a pseudo-documentary than a dramatic piece, I've never been sufficiently interested to pay what most sellers want for it. Clearly the success of Walk the Line has had an influence here, and the two films would make an interesting double feature as Cash found his faith very shortly after the events of that film. In addition to narrating the film, Cash also co-wrote it with Larry Murray. 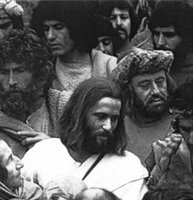 Jesus was played by director Robert Elfstrom who played "the real Jesus as he might have been according to the Christianity Today of 1973. The film cuts between location footage of Jerusalem, re-enacted scenes from Jesus's life, often intercut with shots of today's polluted environement. Kinnard and Davies ("Divine Images") consider that this "technique was weakened by constant repetition throughout the film". As Cash intones the words, "This is My beloved Son, in Whom I am well pleased," it's easy to imagine that God just must have a Southern accent. 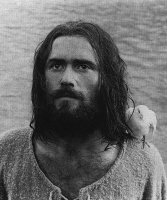 The pauper-budgeted simplicity and naivete of "Gospel Road" — its irrefutable good intentions — overwhelm the weirdness of a movie in which the director (blue-eyed, blond-haired Robert Elfstrom) plays Jesus and the star's wife is Mary Magdalene. There's also a few interesting comments at The Magdalene Review, which discusses this film alongside Jesus Christ Superstar whihc was also 1973 (as was Godspell). Given that my birthday is coming up soon, I think I might have to add this to my birthday list. 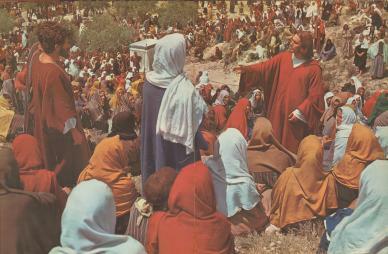 The evening presentations of the Life of Christ opened in July and ran for approximately twelve weeks. The play was advertised as a "Serious religious drama, attractive to the more thoughtful type of visitor." It is unclear then whether this is a film, or simply a promo shot for a play. The text directly next to the photo implies that it is from a play, but the intro at the start of these various photos suggests that is a film. Whilst that could just be a nice intro, I thought I'd throw it our to see if anyone knew any more about it. re:jesus is possibly the best designed Christian site I know of - thoughtful but accessible, with nicely illustrated, well presented content, which is frequently updated without changing so rapidly it leaves people behind. So I was pleased to discover they have done a special section on The Da Vinci Code ahead of the release of the film, starring Tom Hanks, in May. (There's also a nice section looking at different images of Jesus over the last 2000 years). I'm already tiring of the tidal wave of Christian responses to this film, but rejesus' site is at least an appealing place to start. 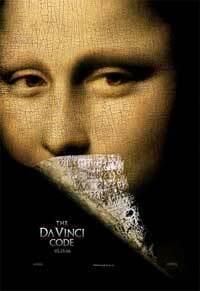 I'm still getting up to speed with "The Da Vinci Code". I've not read the book yet, but aim to before the film comes out - which doesn't leave me very long. Meanwhile I've been keeping an eye on the plagiarism court case on the BBC website. The latest entry there however, is mainly about just how dull the case is. Regarding the plagiarism case I can't really see how Baigent and Leigh have much of a leg to stand on. None of the main ideas here are particularly original, it just seems to be two sensational popularists suing another for doing a better job. There's also an online discussion about the painting and the novel from BBC Radio 4's Front Row arts programme. From a worldwide perspective, Jesus is possibly the most influential image of Jesus in history. The film, made by Campus Crusade for Christ in 1979 to be a tool for evangelism, has apparently, been seen by over 5.4 billion people.1 Whilst that figure includes numerous repeat viewers, and may not be that accurate, it is still incredibly impressive. 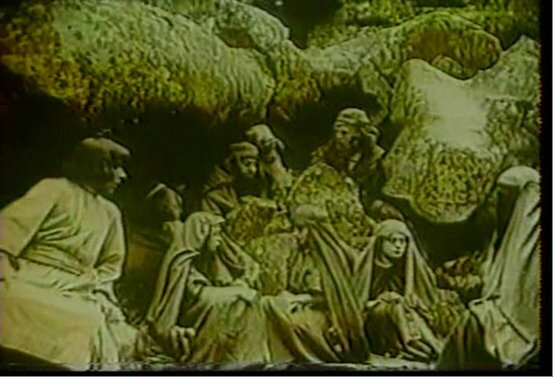 Cecil B. DeMille, years after he directed The King of Kings claimed that his 1927 film had reached more people with the gospel than any other work except the bible. Today that position has been usurped by this film - an even more impressive task given how much bigger the world's population is today compared to 50 years ago. What is strange, is that few people in countries that speak its original tongue would claim to have seen it. Yet it has been translated into 909 languages with another 232 in progress.2 When a new translation is made native speakers of that language are asked to play the various parts. I can't help but wonder if one day they'll be a great Jesus actor re-union, where all the actors who've provided his voice in the different version meet up to exchange stories over fish and bread. The Papua New Guinean Jesus is explaining to the Mongolian Jesus how there is no word for lamb in his culture, whilst the Yup'ik Eskimo Jesus explains to the Swahilian actor that they have 15 words for snow and he didn't get to use any of them. It's too easy to judge a film 30 years later for how quickly it has dated. Whilst some films still look like they could have been made yesterday (e.g. 1977's Jesus of Nazareth), others, such as Jesus Christ Superstar (1973), that supposedly looked good at the time look awful today. Nevertheless, Jesus was made on a small budget, a fact reflected by it's poor budget. This is accentuated by the wooden use of the biblical text. It's hard to know who to blame for this - writer, actor, director, or all three - but the end result is that the written dialogue, from an undynamic translation comes across as stilted. At times the natural rhythm of the scene is ruined by the need for one of the characters to deliver the verse by rote. That said occasionally the film liberates itself from the text, such as the moment when Jesus stands up and is cast into darkness as he says "that is enough". 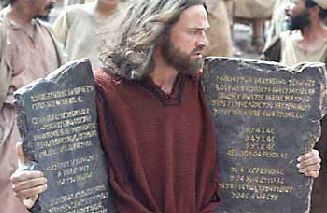 What is also unusual about the film's use of the bible is that the film ends on a quote from John's gospel, not Luke's. This actually epitomises relationship to that gospel as well as Luke's. Whereas Luke's motivations for writing are not entirely clear, John's stated intention for his gospel is that his readers "may know that Jesus is the messiah, the (S/s)on of God". This correlates with the film-makers' aim to create a film that is an evangelistic tool. Luke's narrative arc is more engaging, and as such was a wise choice, but John's influence is never far away. That said, the film does also retain a strongly Lucan emphasis at points. This is possibly the only Jesus film ever not to have included the crown of thorns, which is absent in Luke.5 Actor Brian Deacon caught pneumonia during the baptism scene in order to fulfil the literal landing of a dove on Jesus's shoulder. In Mark's gospel this is only a simile. The film is also one of the only ones to tell the story of Zaccheus, and retains distinctly Lucan parables such as the Good Samaritan. Jesus then, reflects the roots of its project. The film-makers were allowed more freedom to abridge, add to and shape the text of Luke compared to the later Visual Bible's Matthew and Gospel of John, and, as a result, the film is interesting on a literary level. However, film is primarily a visual medium, and despite the attempts at historical accuracy Jesus fails in almost every sense visually. Not only does it fail to exert any sort of cinematic vision, or use the camera in a distinctive or original manner, but it also offers a weak portrayal of that which is in front of the camera. Brian Deacon is a believable Jesus, and Luke a believable storyteller, but somehow the film fails the link the two in a credible cinematic fashion. 1 - From "The Jesus Film" website. 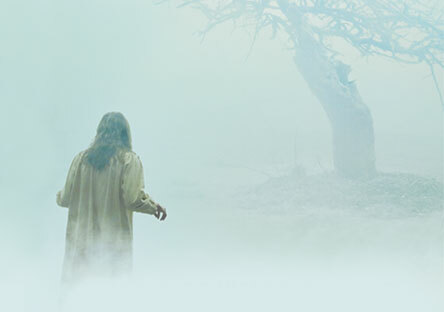 2 - - From "The Jesus Film" website. 3 - The first film to show the nails going through the wrists was 1935's Golgotha. 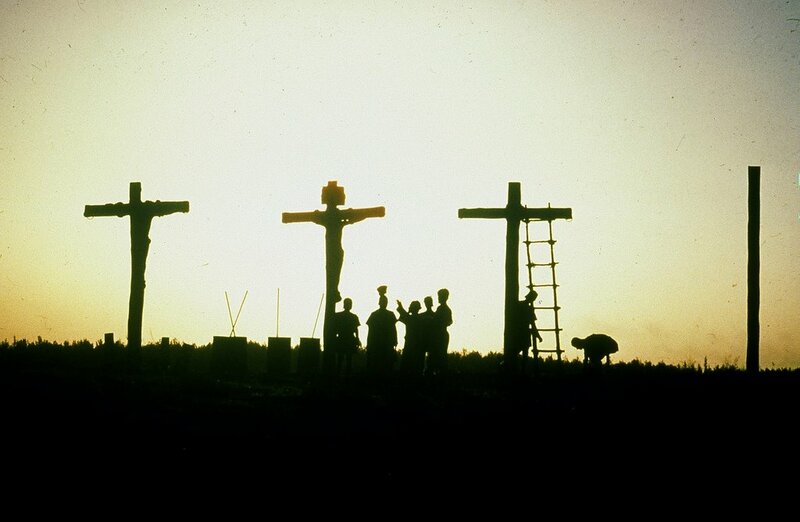 The first film to show Jesus carrying just the crossbeam was Jesus of Nazareth (1977). 5 - Nevertheless the film was criticsed in some Christian circles for excluding it. Over at FilmChat, Peter Chattaway reports on how the Easter season is bringing with it a host of old religious epics coming to DVD!. Peter's most excited about the 50th Anniversary edition of The Ten Commandments (1956), which also includes the earlier silent film by DeMille as well (a little bit like how he recent release of Ben Hur did this - see my earlier blog posts). As I already have both these films, albeit on VHS, I'm less excited by that than he is. 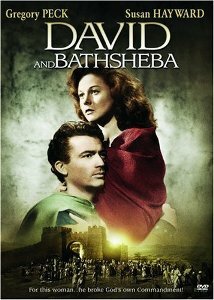 What I am excited by is the release of David and Bathsheba (1951) which I've never actually seen. It's one of the Films that Babington and Evans discuss at length in "Biblical Epics", plus it stars Gregory Peck who is one of my favourite actors. (Just the other night my wife and I were watching him in Big Country (1958) which is the film, linking these two DVDs as it also stars Charlton Heston). From a timing point of view having recently watched one of the earliest David films, I'm keen to see what one of the most famous is actually like. By the way, the review of Jesus will either appear later today, or more likely on Monday. Ex Quo reported last week that "The JESUS Film" is now a video podcast. The Jesus Film (actually, it's entitled Jesus, but everyone knows it as THE Jesus Film) is now being released as a video podcast. It is optimized for 5G Video iPods, but you can watch it through iTunes. As of today (Feb. 24, 2006), four chapters (usually around a minute each) have been released. If you have iTunes, you can add it by clicking here. It's been available to download, in an dizzying array of languages, for sometime now. I'm going to review the film tomorrow, but just a few general links and points before I do. Firstly, overall I tend to agree with Mark Goodacre's main question about "That Jesus Film" namely how can it "be so successful as an international tool of evangelism when it is so bad"? (He also comments on it elsewhere). The second question I have is. AS far as I'm aware, there are currently five major analyses of the major Jesus films - "Biblical Epics" by Babington and Evans, "Jesus at the Movies" by Tatum, "Savior on the Silver Screen" by Stern et al, "Imaging the Divine" (Baugh) and Walsh's "Reading the Gospels in the Dark". Of those only Tatum's volume actually discusses the film. There is some discussion of it in the reference works by Kinnard and Davis ("Divine Images"), and Campbell and Pitts ("The Bible on Film"), but in depth analysis is underdone. I'm not sure why this is. A number of possible reasons suggest themselves. It could be because the film is so badly made. But given the genre this is hardly a reason to exclude it. In fact the question of why such a poorly made film has allegedly become the most seen film in history is interesting in itself. Alternatively it could be because the film wasn't a big box office film. Again, given many of the other films this shouldn't exclude discussion. It was actually the first Jesus film saw at the cinema, and in the intervening 18 years I've only managed that feat with 3 other films. It could be because it only focuses on one gospel. This is certainly what Tatum finds most interesting about it, particularly as really it's more like John (at least in its intent). There are various other potential reasons, but none of which seem unsatisfactory. Perhaps the Christian conspiracy theorists have the most plausible suggestion. 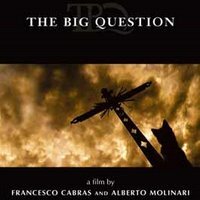 Peter T Chattaway notes that The Big Question, a behind the scenes with a difference film from The Passion of the Christ has gone straight to DVD. A newswire from Christian News Today reports how feedback from some publicists is that it "may be too Christian for the mainstream, but not Christian enough" to be popular with the Christian market. It was originally scheduled for a wide cinematic release, but now will just go straight to DVD. It looks like the marketing ploy with this one is to position it as a discussion starter. That sounds OK in principle, but I can't help wondering if most of the people in the room for most of these discussions will already share broadly the same opinions. The film has been doing the rounds for sometime now. It's over two years since The Passion of the Christ was released in cinemas, and as this review dates from March 2005, it's been available to some people at least since then. "The Big Question is a 75-minute documentary movie where the cast and crew from The Passion of the Christ are asked about their faith and beliefs in God". The experience of watching the film is apparently slightly surreal due to the pseudo-1st century costumes and backdrops, but very 21st century dialogue. The film has seemingly tried to take a round table approach to the film, excluding subtitles explaining who people are to reduce the star power. Whilst this is a noble approach, it seems liable to backfire. Everyone knows who Mel Gibson is, but the guy that speaks after him is going to be even less memorable without a name or a role. If a film like this is going to really make the most of it's idea, it will have to do more than just capture it's interviewees talking in a general sense about theses issues, but somehow relate that to the film. Otherwise, The Passion angle is all about backdrop and marketing; the actual content could simply be achieved by taking a camera onto the streets. Can you name this Jesus film? I got an email from someone trying to trace a Jesus film made in Britain (Poole, Dorset to be precise) between 1949-1952. They thought John the Baptist had something to do with it, and Lady Leyes was apprently involved. It was made by the Bible Society. I think it's The Westminster Passion Play - Behold the Man (1951), certainly the dates are right. Furthermore, Campbell and Pitts note in "The Bible on Film" that "to evaluate the film critically would be unfair, as it was a church project and not meant to be a professional film", so this fits the "Bible Society" criterion very well. On the downside, most Passion Plays wouldn't have much to do with John the Baptist. That said there is of course a chance that this one might have done. It was based on a play by "Walter Meyjes", but I can't seem to find that play for sale anywhere, so that can't be checked. The other piece of info that doesn't quite fit is the Lady Leyes connection. There's simply no information on it that mentions her. 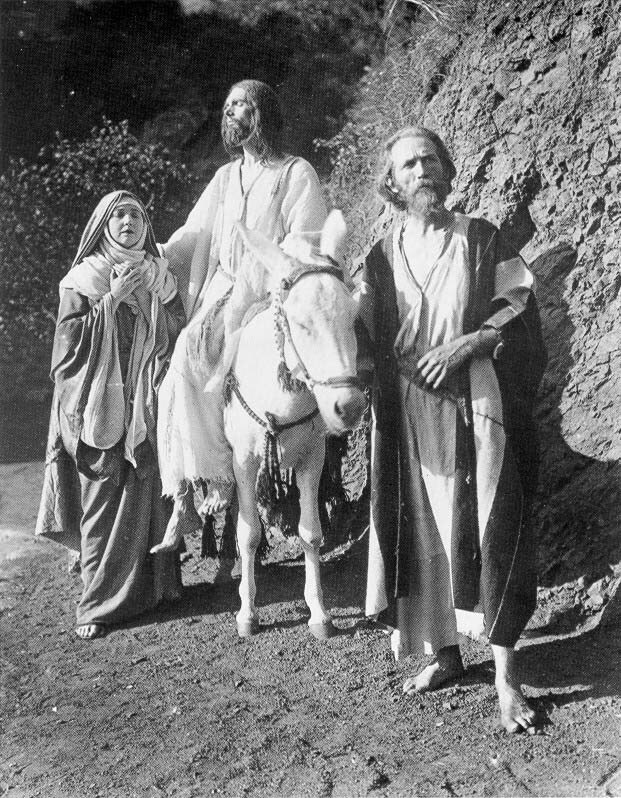 This is far less critical than the above as lots of people would have been involved and I only have the name of the writers (Walter Meyjes and Walter Rilla), the director (Walter Rilla - pictured right), the producers (Susan Dallison and Fred T Swan), the narrator (Walter Meyjes) and the actor who played Jesus (Charles P. Carr). Does anyone know anything about either the original query, or Behold the Man? I've not seen it, and wondered if anyone else might know more. It has never been released on DVD or video (as far as I am aware) though I would dearly love to see it. Sandra Brennan (All Movie Guide) notes that "This British drama is based on an annual production from Westminster Abbey and movingly chronicles the last days and subsequent death of Christ". There's so much discussion on the Oscars that I've not really got much to add. Apart from anything as my four favourite films released in the UK last year (Hotel Rwanda, The Edukators, Downfall, and The Woodsman) were all without nominations, I wasn't really that interested. However, I thought it might be worth posting a link to my review of Crash - the film which was awarded the "Best Picture" statuette. As I noted in my review, this film gives the best depiction of "The Good Samaritan" (Luke 10:25-37) that I have seen - It's fairly rare in Jesus films, and generally the impact of the story is lost due to over familiarity. 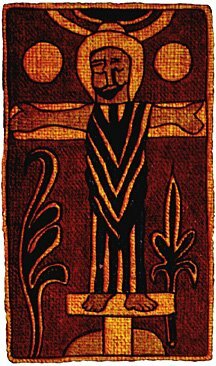 La Vie Et La Passion De Jesus-Christ, N.S. was begun in 1902 by Ferdinand Zecca (1964-1947) for Pathé Frères in Paris, then the most important film company in the world. Zecca made 18 carefully costumed and staged tableaux against painted back-drops which are clearly influenced by the famous Biblical woodcuts of Gustave Dore (1866). 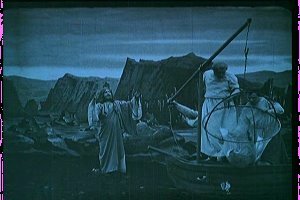 In 1903, Pathé Frères developed a sophisticated system for applying up to four colors to each film print by a stencil process; that year and in 1904, ten new tableaux were added to the film. Finally, in 1905, Zecca's collaborator, Lucien Nonguet, added three final scenes, and the resulting color film of 31 tableaux with a running time of 44 minutes became the most impressive of its kind and one of the first long films in the world. Presented by missionaries and itinerant showmen from Indiana to Indochina, it helped establish the popular iconography of the Divine story. 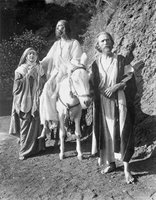 This edition is restored from two excellent 35mm original prints and presents The Life and Passion of Jesus Christ as it looked a century ago. Nearly every shot is a simple tableau in which the camera stands still and observes the entire stage, as it were, while the actors move about within the frame. The few exceptions to this format stand out precisely because they are so rare. As far as I can recall, this is the only film about Jesus that chooses to show the Transfiguration. There are two others which also do, The Visual Bible's Matthew, and the Genesis Project's Luke (which was condensed into the Jesus film, both of which had to cover the as they were filming the whole gospel. That said the former film avoids showing it anyway - simply showing the narrator (if I remember correctly). The latter film, however, didn't have to include that episode in the cut down film Jesus, but still does. Since this has been professionally released the quality of the print is much better than the other films, but even so it appears that it has been restored to something of it's former glory - there is a real crispness to the images we see here. Another scene that is usually ignored is the Woman of Samaria. Other than this film and it's siblings (I should mention that this film was shot for shot re-made in 1914/1915 with a couple of extra scenes, and extra intertitles and released as Son of Man) the woman of Samaria story is only included in Il Messia (Rosellini - 1975), and the Visual Bible's Gospel of John (2003). Again in the case of the latter film the scene had to be shot. This story is a popular text for preaching, and so it's strange that it is generally ignored in film. Sadly despite this film having been widely available in the last few years there is relatively little comment available on it. The best review I've come across is by Steven D Greydanus. He says so many things so well that rather than repeat them all again, only less eloquently, it's better if I just link to his review at Decent Films. In addition to his discussion of the film linked to above, Peter T Chattaway also comments on the film at Canadian Christianity. The three of us also talk briefly about the film at Arts and Faith (there was a longer thread on the old forum, but sadly that appears to be lost). 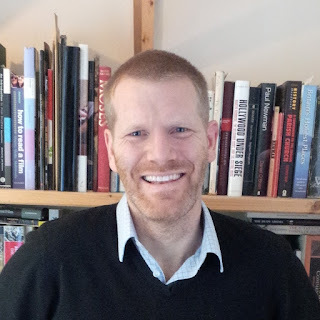 Finally, Mike Hernstein of the Flickerings festival discusses it as part of his excellent Survey of Jesus films - probably the best collection of comments on Jesus films on the web to date. 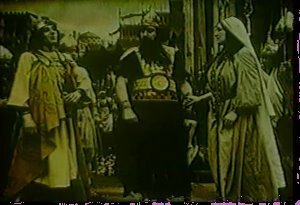 The final films on the DVD I've been discussing this week are both about the Hebrew King Saul; David et Saul (David and Saul) made in 1911 and La Mort de Saül(The Death of Saul) made two years later in 1913. "The story of David and Saul is an interesting and ambitious choice of material, and this short feature does a creditable job of filming it. The story has plenty of action, plus some significant psychological themes, and this movie succeeds in bringing out at least some of both." 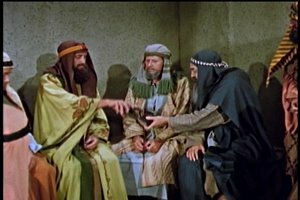 In my opinion the most successful biblical films have been those that use less familiar material to challenge our pre-conceptions, or are at least more concerned with trying to explore their protagonist's motives. It's interesting that the first film starts with a celebration of David's victory over the Philistines. I put chapter 17 as a possible reference, but that's probably just re-coiling from the fact that the most likely victory this refers to is the one where he gives 200 Philistine foreskins to Saul as a wedding dowry (1 Sam 18:27). Certainly the fact that at the end of the scene Saul holds David and a very un-cinematic Michal together indicates that it is this victory which is being celebrated. 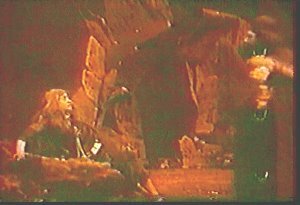 Although this film doesn't actually show the incident where David chooses not to kill Saul when he had the chance, it does refer to it in the intertitles "Fatigued Saul seeks repose in the cave where David was hidden". However, instead of seeing David cut Saul's cloak or steal his spear, the scene following this intertitle seems to portray David hiding on the other side of the mountain (1 Sam 23:24-28). The film crams a lot in, in a very short time, and it's hard for the viewer - even if they have a good knowledge of the various stories - to work out what is being depicted. The break between the two films on the DVD I have is very slight, and most of the scant discussion of these two films on the web seems to treat them as one. In fact I noticed that the title of the film, placed at the top of each intertitle, changed before I noticed the briefly shown intertitle card that announced the new film. the way this action is filmed is on a par with anything today, and is the most impressive sequence I can recall at any point before Birth of a Nation revolutionised film in 1915. Thy sword shall avenge the God of Israel"
It's not quite what Samuel says (1 Sam 28:19), but the way the film takes each clause and shows it happening is a far more sophisticated narrative device than was standard for the era. Finally, although the second film is about the same length as the first it takes things much more slowly. The emphasis here seems to be much more on Saul and what is happening to him internally, than the events that are happening around him. It also allows a chiastic structure to the events. The film starts with Saul destroying the priests of Nob, and ends with him being destroyed by them, separated only by an announcement of God's judgement upon him, and linking the two actions nicely together.